When I heard that Amazon was coming out with a Jack Ryan series, I was a bit surprised, because I figured that was a character, and a universe, that had run its course. 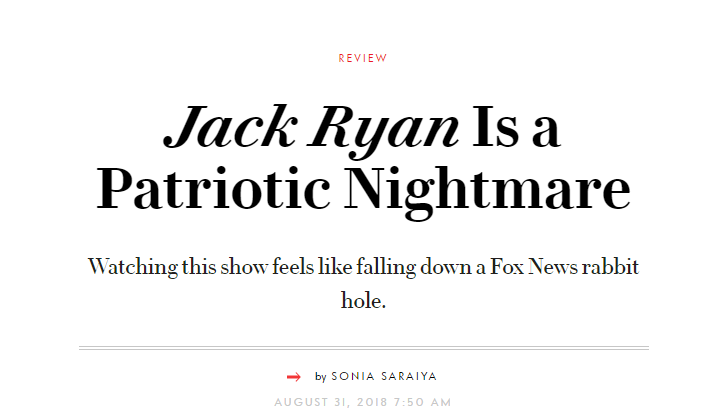 Don’t get me wrong, I had been a Tom Clancy reader since the 1980’s, and had watched most of the film iterations of Jack Ryan. But that was a character created in the Cold War and the world now is so different from the one where a young Jack Ryan was on the chase for the Soviet submarine Red October. How could I say no? So I decided to give the show a chance. First off, John Krasinski really pulls it off as Ryan. I’ve heard some people argue that they just can’t get past his goofy Jim from The Office persona. However having already seen him take on a tough guy roll in 13 Hours I had no problem suspending my disbelief. In fact, if anything it helps the role of someone who is primarily an academic but is reluctantly thrust into the action role. Of course, an academic being thrust in action roles does strain the bounds of credulity. That was one of the weaker parts of the show in my opinion, Ryan’s boss James Greer (Wendell Pierce) does have an operator background, yet constantly drags Ryan into dangerous situations, totally out of his skillset. The other notable on the show is Ali Suliman as the terrorist mastermind, Mousa Bin Suleiman. As noted in another review of the show, this actor really sells it as a complicated villain. He could have simply played this as a simple, evil, religious fanatic, but he has a backstory that gives his actions, if not exactly justification, at least reasonable within his mindset, and it shows. If anything, he has the most difficult role in the series and manages to pull it off beautifully. One thing I noticed in the pacing of the show, in deference to it appearing on a streaming service, is each episode ends leaving you wanting more. And although I’m just not a binger, we did end up watching the last three episodes back to back. I didn’t want to stop. So yeah, I have to give the show a big thumbs up. And as for the Vanity Fair reviewer? She was totally wrong. This wasn’t any sort of jingoistic right wing Fox News anything. You would be hard pressed to find any sort of political bias in this show, unless you regard Islamic terrorism as a fiction created by right wing Republican Presidents. In any case, this show has already been renewed for season 2, so the reviewer (and me) will get a second chance to reconsider when the show’s focus swings around to…Russia!